So what is all this about you brewing I hear you not ask ? Well, it is a simple project of mine to learn about brewing and go from absolute novice to being able to produce a good standard everyday beer that I would be happy with...a pretty low goal to set myself but of course there is the hobby factor which I am enjoying, well apart from all the cleaning and sterilizing...and bottling. So far I have brewed using beer kits, extract recipes, partial mash, steeping speciality grains, adding extra hops and dry hopping. No doubt I will take the plunge and go all grain sometime in the coming months but so far I am happy/comfortable with what I've done so far. The first brew, a golden ale, is just passable to drink. The second, a stout, is very promising although it needs a good amount of conditioning still. The third, a mongrel amber concoction/vienna/steam beer is not long bottled, the sample pint I drank from the fermenting vessel while bottling was very tasty so I have great hopes for it, using san francisco lager yeast seems to have paid off. The fourth, an extract belgian ale is fermenting away like mad and the whole place stinks of malt, not so good wife acceptance factor with this one as the fermentor is in the bedroom with the windows closed to keep the temperature up :/ I have an IPA then a red ale to do after then I will take stock and probably buy a lot more equipment than the 2 fermenting bins and soup pot I am using just now. Mild aroma of malt, chocolate, coffee and cigar !? from the pour. Porter pours black with a quick falling brown creamy head. Mildly sweet roasted malt in the intake with hints of smoke, heavily roasted coffee beans and touch of licorice which leads into a dark chocolate bitter finish. This has a very nice long chocolaty aftertaste. Lowly carbonated, the mouthfeel is smooth and creamy. No alcohol shines through. Absolutely solid and simple imperial stout....for the price. This has such a well rounded taste, for me it is perfect for sipping while contemplating why I bother paying five times more for a local craft beer or an import. Definitely in my top five of Danish great value for money beers. No doubt, a regular again in my house in the coming autumn and winter months. Summing up, superb Danish value for money macro stout which puts a lot of the micro breweries to shame. This scored 9/10 on the 'this came from an industrial, really ?' Beerometer. 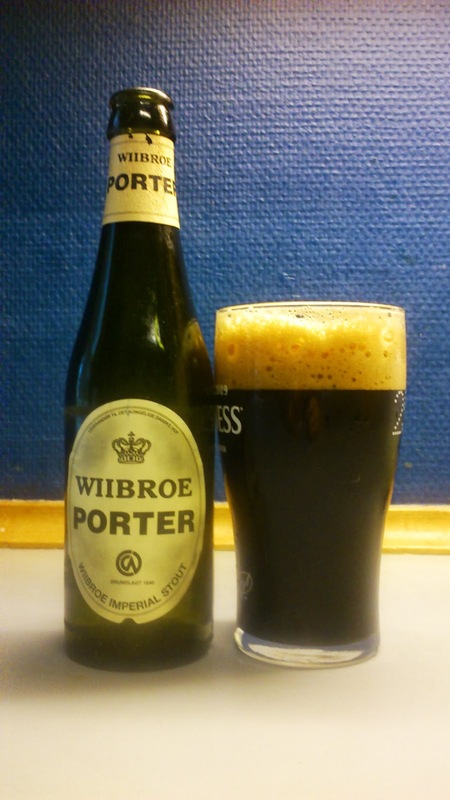 Have to agree with you on the Wiibroe, wonderful porter that I first tried in Copenhagen and have since tried to find a recipe to brew it myself. Munich and caramel malts? Thanks for the comment.Long time since I last had one...or updated this blog. Yeah, lots of munich and caramalts according to their website. If I was going to attempt something like this I'd maybe add some weyermann smoked.